Last week, I turned the television off for three days. I wasn't upset with the results of the election. I wasn't busy with work or wearied by reality program or the shocking gratuitous content of much prime time scripted programming. Rather, I just couldn't take one more ad hominem attack from the left or from the right in the latest evolution of cable television news: the angry politically partisan host. Several months ago, Paula Zahn left cable news before the end of her contract. She stated that her ratings had fallen; audiences seemed to be looking for subjective, angry hosts, and she was committed to journalistic objectivity. What a quaint notion. These days Hannity rudely interrupts guests, refusing to let anyone except those espousing his own point of view finish his or her line of thought. His questioning is agressive and abusive, slanted toward reaching a pre-determined conclusion. He is not interested in any kind of honest examination of the issues, and he does not espouse an open spirit geared toward discovery of a new idea or solution. 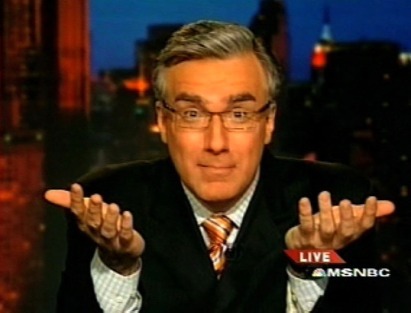 Lest the democrats get too smug, trust me when I tell you Keith Olbermann is just as bad. The superiority he radiates in his "Worst Person in the World" segment is staggering. So obnoxious has he become that he was actually spoofed by an avid democrat (Ben Affleck) on SNL. In the sketch, "Keith" was dishonest, hyperbolic, disrespectful, and arrogant - not too far from the real man. I guess I blame Crossfire. This CNN news show from the 1980s used to give me indigestion. My family watched it during dinner until I finally resorted to turning off the television or changing the channel to MASH reruns. Featuring a round table of republicans and democrats shouting at each other, this show ushered in the argumentative, opinionated, and obnoxious cable news show - now on "art" form. Olbermann and Hannity feed on hostility and insults. They are offensive, even repulsive. I am very sorry to see civility gone from cable news. Where is Paula Zahn and those like her?